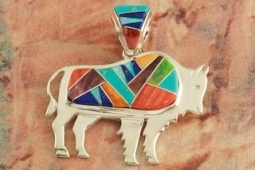 Sterling Silver Buffalo Pendant featuring Genuine Sleeping Beauty Turquoise, Spiny Oyster Shell, Acoma Jet and Blue Lapis inlaid between ribbons of Sterling Silver. Accented with Fire and Ice Lab Opals. 18" 2.2mm Sterling Silver Rope Chain is included. Designed by Navajo Artist Calvin Begay. Signed by the artist. Pendant is 2" L including bale x 2" W.